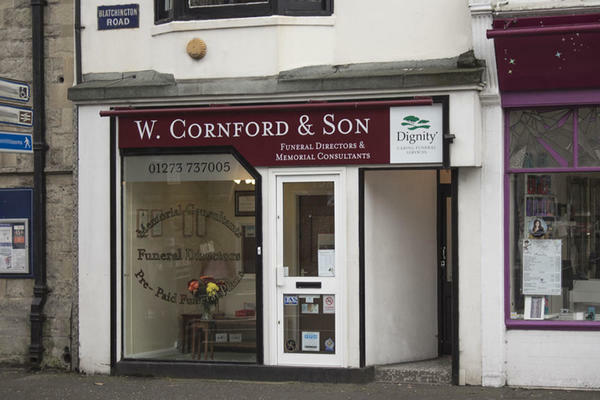 From Blatchington Road in Hove, East Sussex, W Cornford & Son Funeral Directors serves the local community, offering funeral care to families in their times of need. If you have lost a loved one, we can arrange a dignified funeral to remember them by. When you are undergoing the emotional upheaval associated with loss, it is natural to experience feelings of uncertainty or apprehension. The professional team at our caring funeral directors will be there for you, providing support at this difficult time and helping to ease some of the concerns you may presently have. If you want your loved one’s send off to be a uniquely personal occasion, we can tailor the funeral to exactly the way you want it. Whether it is traditional or contemporary, a religious or a humanist service, your wishes are what count. With our East Sussex funeral directors having been established in 1890, you can also rest assured that the knowledge passed down through the generations continues to guide us to this day. Our experience allows us to ensure your loved one’s funeral is a fitting tribute to their memory. You can find our funeral home on Blatchington Road, where we moved to from nearby George Street in the late 1980s. This central location makes us easily accessible to all of Hove and the surrounding Sussex towns and villages. These include Falmer, Lewes and Steyning. For a compassionate and understanding service, speak to one of our team today. You can get in touch 24 hours and there will be somebody ready to listen and offer advice. To arrange the funeral of your loved one, call us today. Call us today on 01273 737005 to talk through your personal requirements. Our funeral home is next to the Central United Reform Church, opposite the entrance to Goldstone Villas. Our staff are available 24 hours a day on 01273 737005 if you require our services outside of these hours. We were very pleased with the service provided and the way the staff, from office to hurse driver, treated us. They were efficient, yet sympathetic.